Los Angeles’ Staples Center will host the most intriguing heavyweight matchup this side of Joshua-Klitschko on December 1’st. For it is in that famous arena that undefeated WBC heavyweight champion Deontay Wilder will face a former heavyweight kingpin, the undefeated Tyson Fury. This isn’t just a compelling match because two young, undefeated champions (some still consider Fury, who was stripped of his titles, the true king of the heavyweight division) are meeting to clear up some of the division’s pecking order. It’s a compelling match for a variety of reasons. These are two very good fighters, after all. Both Wilder and Fury are under-rated, but they’ve gotten to where they are through big wins. Fury’s upset of then champ Wladimir Klitschko in 2015 may have put fans to sleep, but it was a solid and impressive win nonetheless. What’s more, the enormous Fury is awkward and actually rather slick. He’s a gifted ring tactician, plain and simple. Wilder, on the other hand, is equally enigmatic. He carries himself in an odd, some would say less than stellar manner in the ring, but Wilder always, always has come out on top. Against some good competition, too. Anyone who thought the Alabama native wasn’t the real thing got a chance to think otherwise when Wilder bested the skilled Louis Ortiz earlier this year by knockout. Speaking of knockouts, Wilder is an absolute master, unquestionably one of the hardest hitters to ever step foot in a boxing ring. All he has to do is land once. The question is, will Fury allow him that opportunity? That’s what makes this match so intriguing. It should also be noted that both Wilder and Fury posses enormous personalities. With his shouts of “bomb squad,” Wilder carries with him a loud, peculiarly American charm. Fury, on the other hand, is a bombastic Irish Traveler who isn’t short on charm of his own. 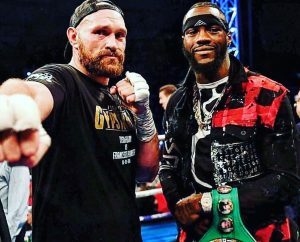 They may not have a whole lot in common, but it’s now virtually impossible to say either Wilder or Fury is afraid to take on anyone. While Anthony Joshua may – or may not – be playing it safe in England, Fury is traveling to his opponent’s home country to restake his claim in the heavyweight division. And his opponent has openly been willing to fight in England if he has to. Wilder has even set himself up to fight a Russian in Russia in order to face a solid challenge (that fight, which was supposed to be with Alexander Povetkin, was canceled when Povetkin failed a drug test). And long live intriguing heavyweight battles.